Cutting up anything into matchsticks makes it more fun, too (besides the bit where it takes dressing more handily). 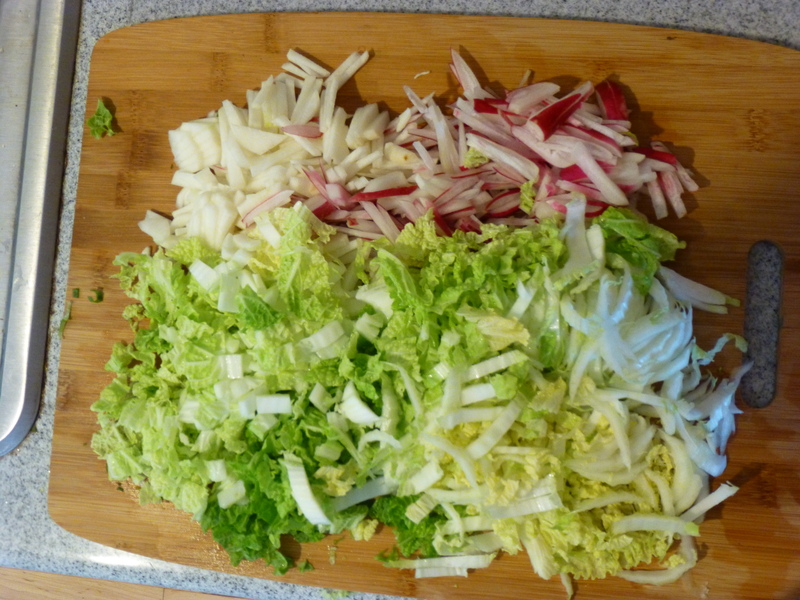 I recommend peeling kohlrabi, cutting in half and then thin slices, then take half of that, flip it sideways (on the flat side) and cut more thin slices. You can kind of do the same thing with apples (don’t peel, but core them), but it’s a little trickier with the core gone. I bet there’s some ridiculous fancy kitchen gadget that will do matchsticks for you, if you really can’t stand cutting them up. To elucidate some comments I’ve made previously re: farm tech, the problem with technological change is much the same problem as GMOs: copyrights. Farmers end up needing to hack into the systems of tractors and other equipment in order to use them. When you reach the point that the farmers are seeking out old versions of tractors just to avoid this problem, you know there’s something wrong with the system. The same could potentially be applied to seeds—the only reason we get so excited about heirloom (historic) seeds these days is because we haven’t been breeding for the right traits (i.e. flavor), so important qualifiers have been lost over time, and some of the newer interesting seeds have weird patents on them. Harumph. There are some cool new developments though (well, a combination of new and old, like many of my favorite innovations), like a tree that has been grafted to produce 40 different kinds of fruit! Trees are so neat. I need to get an orchard when I have a real place, whenever that will be. It’s almost tomato season and I am beyond thrilled. Stay tuned. Cut up the kohlrabi and apples into matchsticks (see above for technique recommendations). Matchstick the cheddar as well. Chop up parsley, green onions, chives, and any other additions you would like. Toast nuts, if using. Whisk together dressing ingredients in a large bowl. Add the remaining ingredients and toss, making sure cheddar pieces separate from each other. Serve with toasted nuts on top. Other variations: More lemon; mint instead of mustard; parmesan instead of cheddar; add radishes for an extra bite or cucumbers to make it milder. P.S. I added my Instagram to the side of the page! Now you can see all my pretty pictures even without an account. You’re welcome. 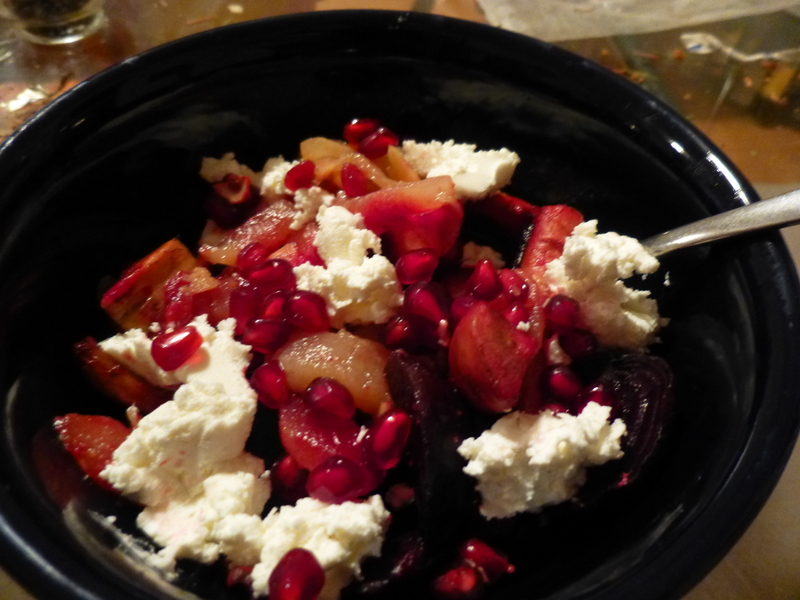 Oh, and with goat cheese and pomegranate seeds. I don’t want to overwhelm you. I am hoping to give you pear envy though. 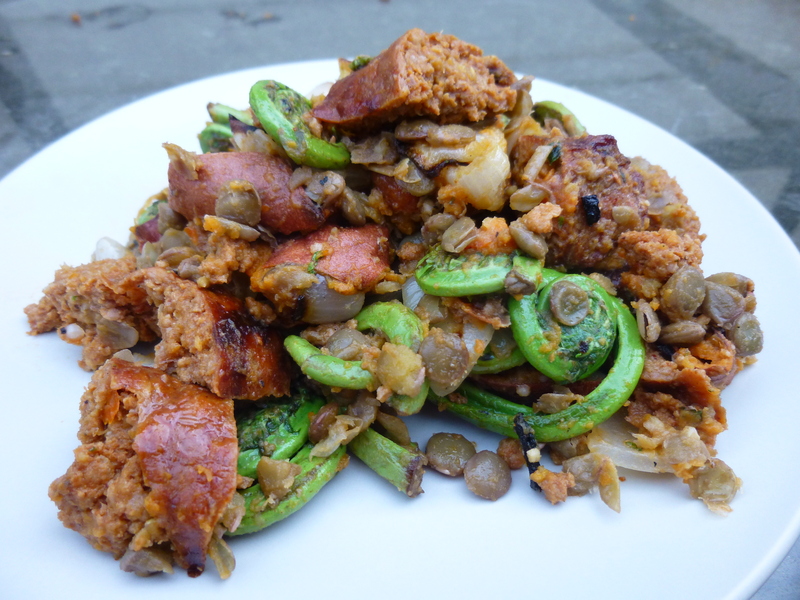 This is one of those awesome dishes that I made partially one day and then refined the next. 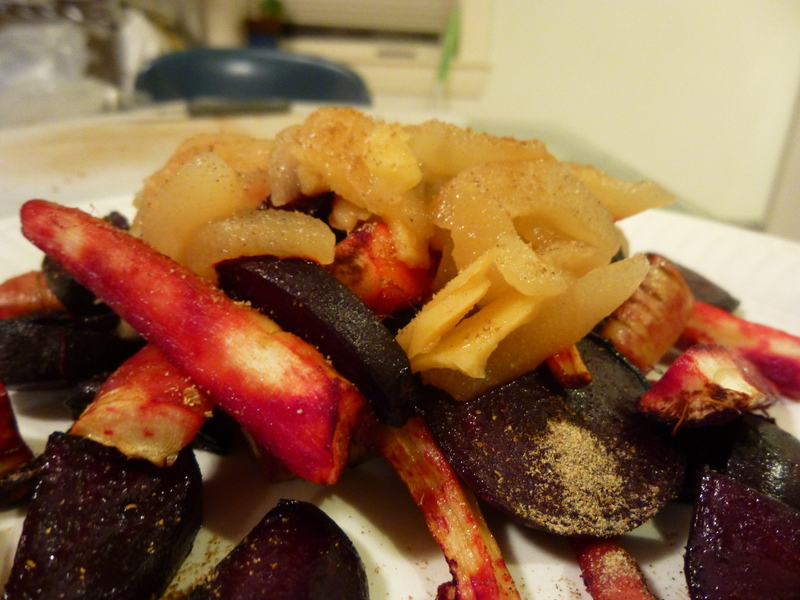 The first night I roasted beets and parsnips together, and poached some pear slices in white wine with a bunch of ginger. It was pretty good, and I did add some spices to make it better, but it was still missing something and I spend a good while mulling over what it needed. The next day I had the same thing but added goat cheese (I had been thinking ricotta, actually, but goat cheese was easier to acquire) and pomegranate seeds. Super delicious and not a set of flavors I encounter as an ensemble too often. I talked a little about poaching pears in my last post. This time I made it up—a little white wine, a little honey, and a whole bunch of ginger. The spice of the ginger pairs nicely with the sweetness of the pears, and makes it more pleasing as a main dish (although to be honest I wouldn’t mind eating it for dessert). 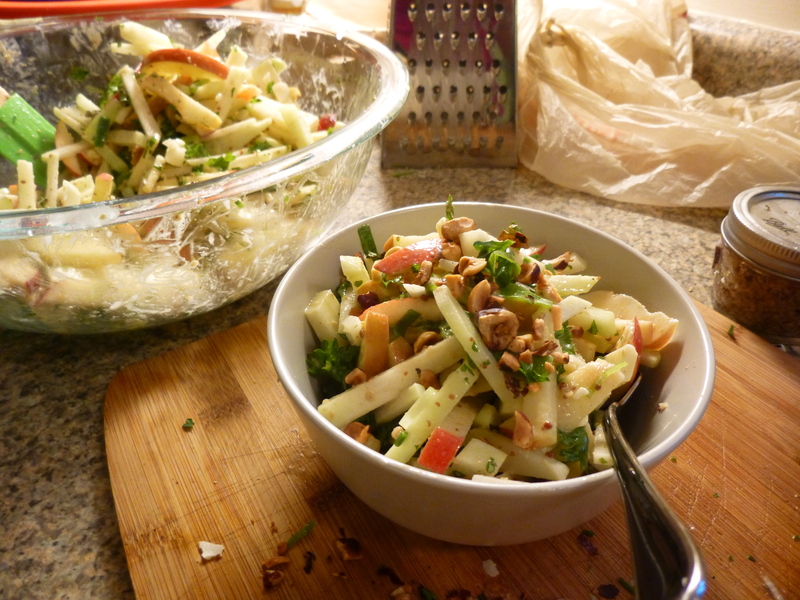 I also sliced the pears because pears don’t soften in the same way apples do and I wanted to make a sauce out of it. Parsnips and beets each have a distinctive enough flavor to stand their own within the dish, but roasting them together allows flavors to blend (or something. Mostly it’s just way easier to only use one pan). 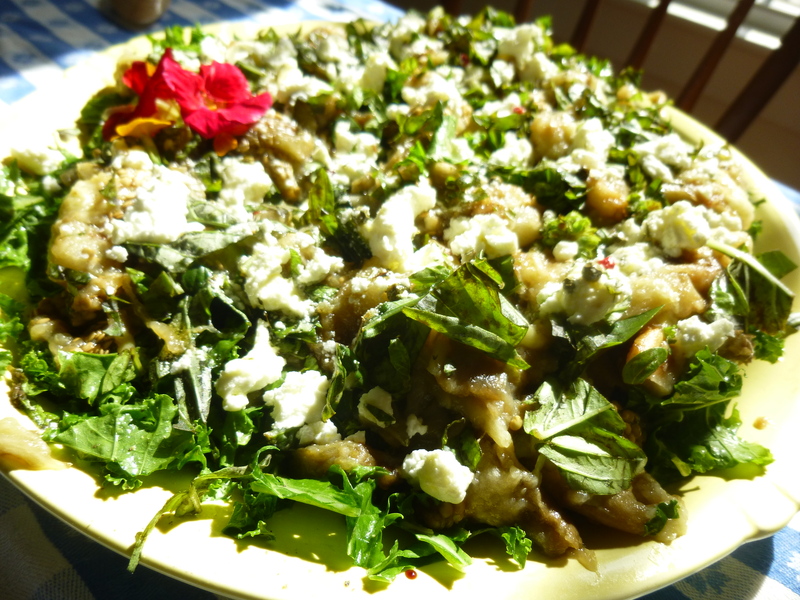 Coriander and cardamom add delicate, floral scents to the dish. I suggest this as a side (/salad?) to your next fancy dinner party. It’s easy, showy, distinctive, and delicious. 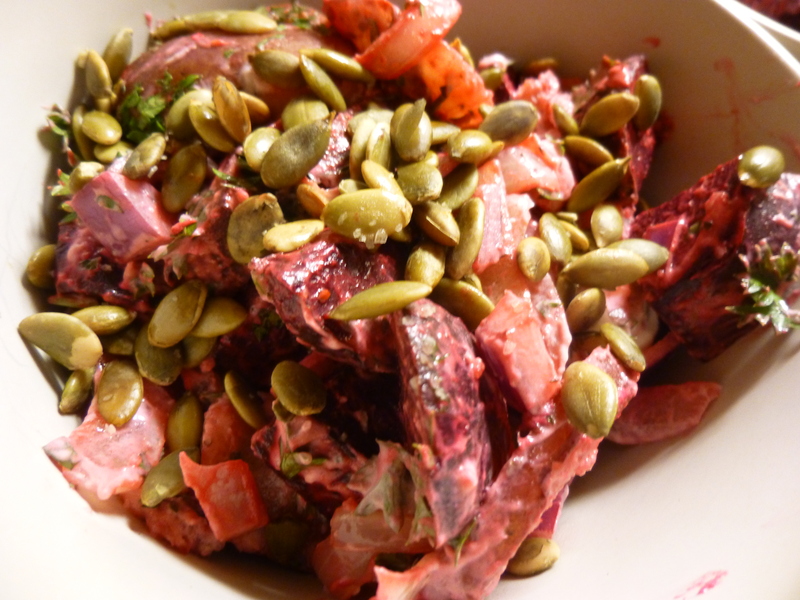 Wash, chop, and roast beets and parsnips with a little salt and olive oil until tender but still with a slight crunch. If you’d like, toss the spices in with the veggies as they cook (I added them as an afterthought, but I think they’d be better internalized). Peel, core, and slice the pears. Peel and slice ginger. Place in a small saucepot with wine and honey. Bring to a boil and simmer gently, covered, for 5 or so minutes, until pears are tender and most of the liquid has evaporated (uncover to evaporate more, as needed). Place roasted veggies on a plate (or serving platter), and cover with pear sauce. Crumble/dot chunks of cheese on top, and then strew with pomegranate seeds. Sprinkle lightly with spices if you haven’t added them already, and serve. With all the fine weather this weekend it seemed like a good time for another salad, which will probably be mostly disappearing off of my menu in the near future. So after I came home from tennis and a quick swim in the ocean (again, probably the last time for a while, and yes it was quite cold), I threw this together and was quite pleased with the result. 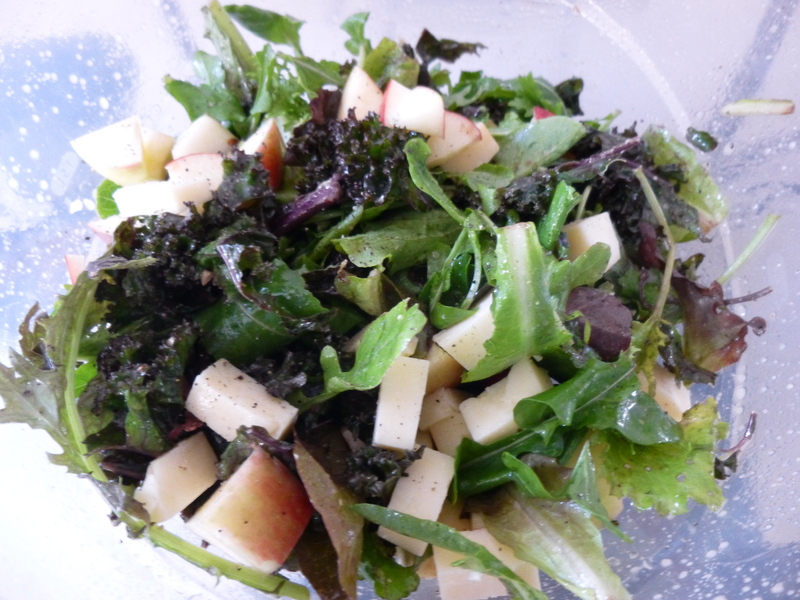 I often eat apples and cheese together as a quick snack (apples and peanut butter is also great), but putting it on top of a salad, with the addition mustard, makes the combination into more of meal. 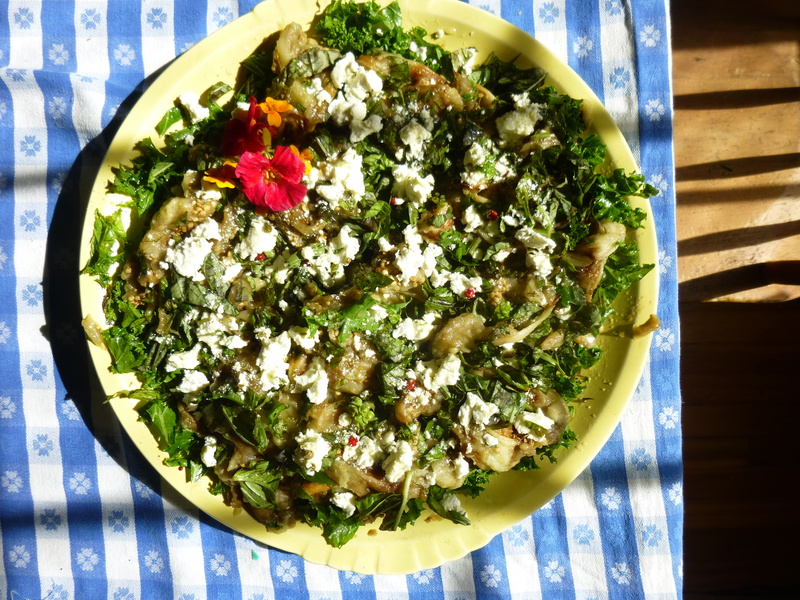 You can make this with whatever greens you want; I threw in a little kale to add some oomph but I like having the lightness of the mesclun as well. 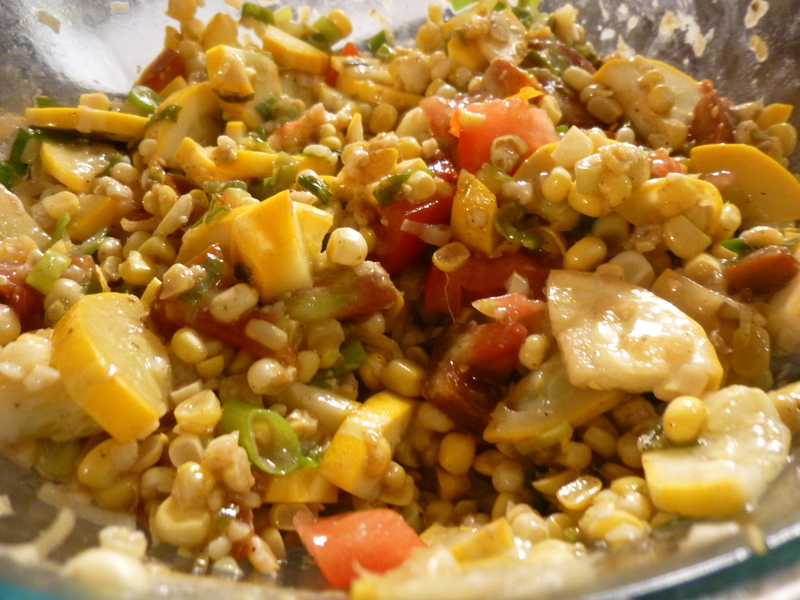 It may make extra dressing—judge how much you like before mixing it all together. Mix together mustard and vinegar, then whisk in olive oil (I generally make dressing in whatever bowl I’m eating the salad in, because fewer dishes). Taste and add other seasonings, as you wish. Put kale in the bowl with the dressing and massage it around for a while (if you don’t know about massaging kale for salads yet, do it. It’s important and makes it much more tender). 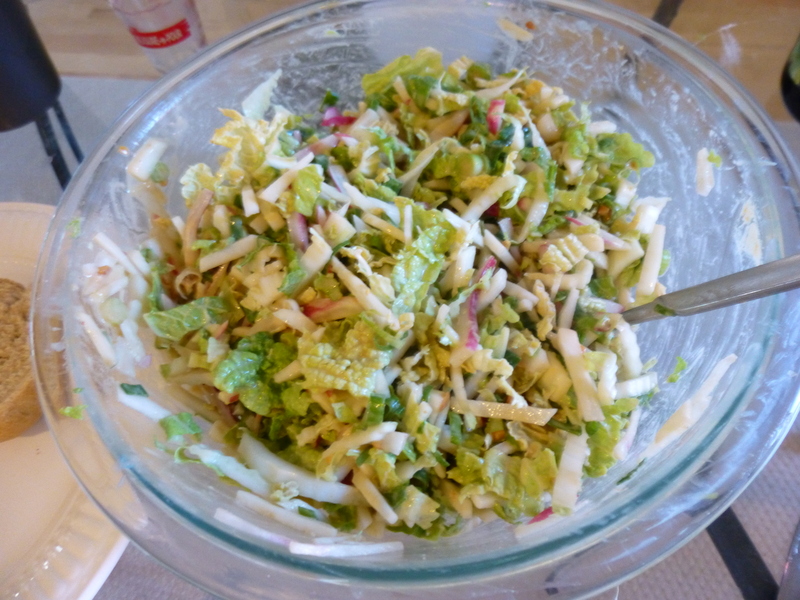 Add the rest of the lettuce and toss, then throw on the apples and cheese. This would also benefit from some nice smoked sausage. Alternatively, you could serve it as a side next to a nice roast (preferably one with lots of caramelized onions) with some crusty bread. Wondering what to do with all that napa (otherwise known as Chinese) cabbage and use up other random veggies in your fridge? Make this now. Recipe here – it would feel pointless re-writing it. I didn’t have carrots, so I used sweet salad turnips instead (delicious), although carrots would be great if you have them. Also I used tahini because I didn’t have sesame oil, and red wine vinegar instead of rice. Otherwise, this is great. And they are very correct, it is best the day-of. Enjoy!